Yellin and Sherman bring to life the struggle of suffragists to earn women the right to vote which culminated with the final vote needed for ratification in the Tennessee legislature. The Perfect 36 gives voice to those who were for and against the right of women to vote with a richly illustrated volume. The authors provide a great deal of writings of those who were involved in this important movement along with pictures and cartoons to give a vivid sense of what it was like to win enfranchisement. 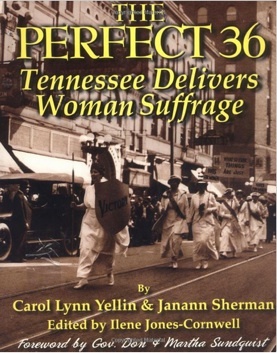 The Perfect 36 is an important resource for anyone interested in how women and men earned the right for women to fully participate in the democratic process of the United States.